As a mom and grandmother, I have been buying toys for almost 40 years. What's important to me now when I give my grandchildren toys, is that they are well-made, creative, and sparks their imaginations. That's exactly what Hearthsong toys do. Hearthsong lets parents provide their children with wholesome, age-appropriate, and high-quality playthings. 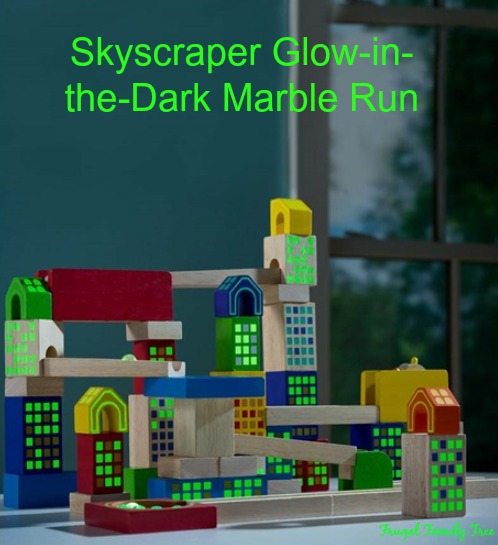 When I was given the chance to review the Skyscraper Glow-in-the-Dark Marble Run, I knew my grandsons would really love it. And they do, with it providing hours of creative play and fun. Our bright-window-filled skyscraper blocks are fun to play with day and night! Glittery windows soak up the sun and reflect it back to you after dark. Build stacks of varying heights and connect their tops with a marble run so you can watch the glow-in-the-dark marbles jump down, around, and along that fun run's stair step, water wheel, seesaw, and funnel. Illuminating! It's really been fun for me to see how creative the boys are with this Marble Run, and the glow-in-the-dark feature is awesome. They love turning off the light at night and playing with it. It's an absolutely great toy that boys and girls will love, all the while using and developing their imaginations. You can visit the Hearthsong website here to shop for toys. It's actually one of the best shopping sites I've ever used because it's so in-depth and easy to navigate. It lets you find the perfect toy for your child by age groups, interests, categories, and prices. And using the Gift Finder is very helpful to narrow down your choices from the hundreds of selections available. I love talking about the Hearthsong company because it's toys remind me of the days when children had the chance to be creative and make using their imaginations a part of growing and learning. Good toys like these are important, I think, for developing creative thinking and imaginative playtime. Besides the Hearthsong website, you can visit them on Pinterest, Facebook, and Twitter. I'm so happy to share with you that Heartsong is giving away a $50.00 gift certificate to one of our readers. Be sure and enter and have your own chance to experience these great toys. *Limited to US residents 18 years old and above. Giveaway starts Dec. 18, 2014 and ends on Jan 1, 2015 at 12:01 am EST. Winner will be emailed and has 72 hours to respond before another winner is selected. I was not paid for this giveaway or post. The opinions on this item are 100% mine and may vary from others. The sponsor is responsible for providing the prize. I was sent a product to review for this post. I love the Two-Story Wheel Town Fire Station. I like the Woodland Fairy Home. I love the Deep Space Planetarium and Projector! I'd love to get my kids the Incred-a-Ball! Fun! Oh I really love the Ultimate 255-Piece Domino Race Set! That looks like so much fun! I love the Celestial Starry Night Hideaway!! The round and round swing looks like a lot of fun. I love the Serafina Plush Unicorn!